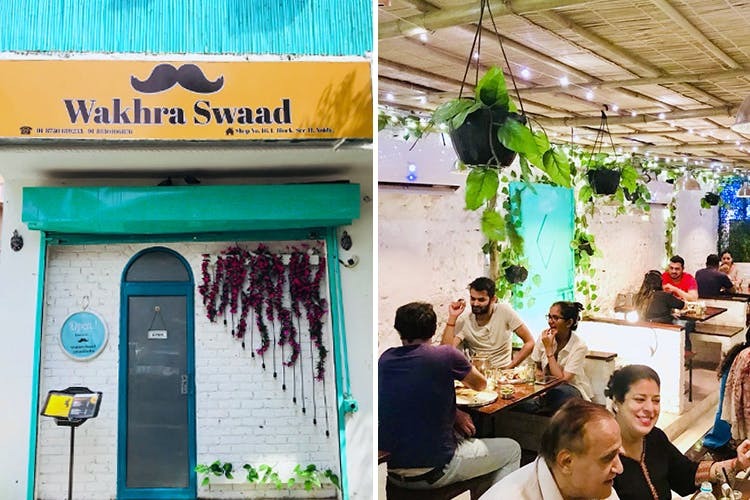 We know people who’ve seen Wakhra Swad grow from being a hole-in-the-wall momo joint in Sector 18, Noida to this urban dhaba over the years. If they’re all to be believed, we have every reason to make a trek to their new dhaba in Sector 11, and eat their street-style biryani and chicken pizza momo. Arjun, the man behind the restaurant speaks so passionately about the kathi rolls and laal maas that it’s easy to see why Wakhra Swad is still on top of its food game. Their menu hasn’t undergone a sea change and this is why, the loyalists are rejoicing as much as the first-timers. We love how the cosy, laid-back ambience, replete with plants and fairy lights, comes together with North Indian grub. They’ve got a massive variety of tikkas, kathi rolls, momo, biryani, curries, kebabs and lassi and aam panna to wash it all down. Thanks to this familiar menu and comfy seating, it’s no surprise that Noida folks are taking to Wakhra Dhaba all too well. The house is divided on whether the dahi kebabs are better than the haryaali kebabs but the paneer tikka is a constant. Changezi chicken, garlic naan, mutton biryani and paneer lababdar are sure coming to our table when we visit. For now, they’re taking a break from their ever-so-famous vodka momo, but they intend on bringing it back as a daily special. Meanwhile, why don’t you treat your indecisive, momo-loving self to their momo platter? It’s got Afghani, tandoori, butter chicken and more veg and non-veg treats to offer. We all love pasta and a cracker-thin spinach pizza, but when we’re ravenously hungry (or inconsolably sad), nothing beats a good tandoori chicken and dal makhani. Echo this sentiment? See us at Wakhra Swad sometime.